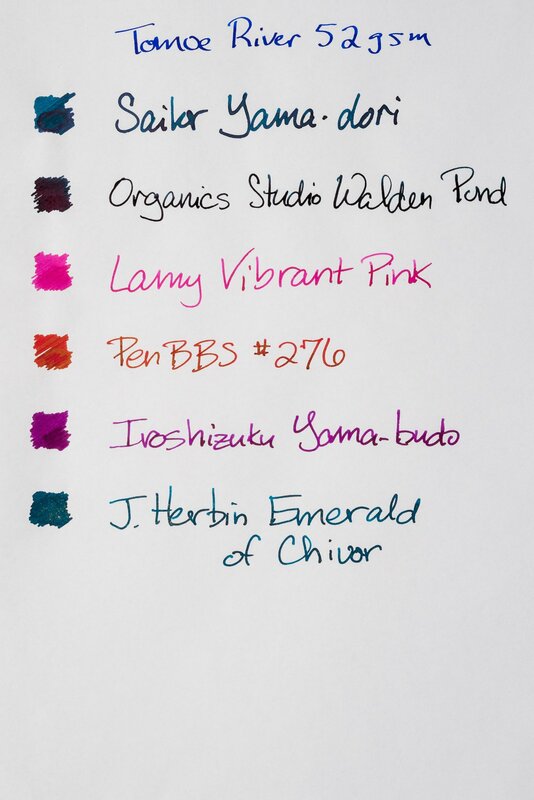 There is a lot of interest in sheening inks these days, and with good reason. 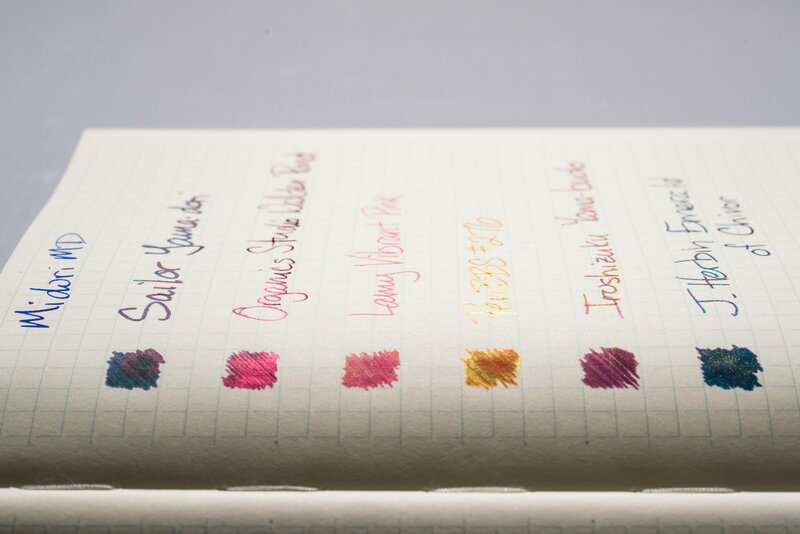 Sheen can add visual interest and character to your writing. Sheening inks are also fun to use! 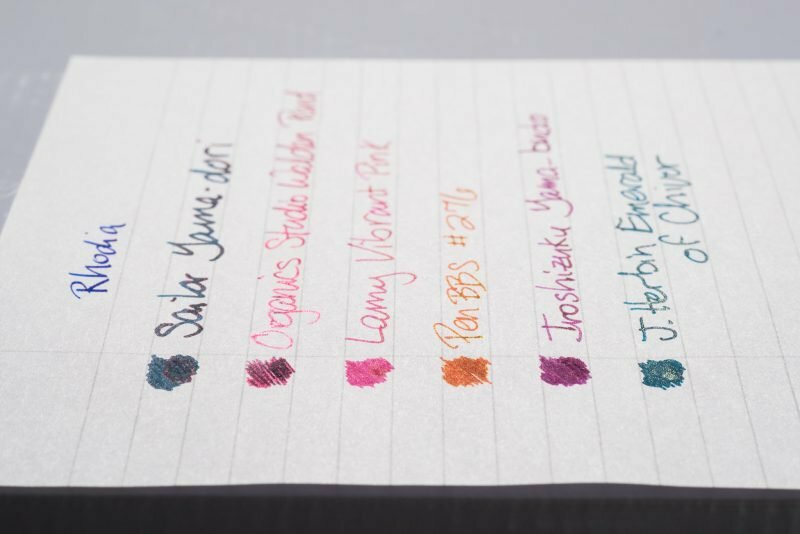 In order to get the best sheen out of an ink, you’ll need to use the right paper. In this article, I want to take a look at how different papers affect fountain pen ink sheen. I think you’ll be surprised by the results! 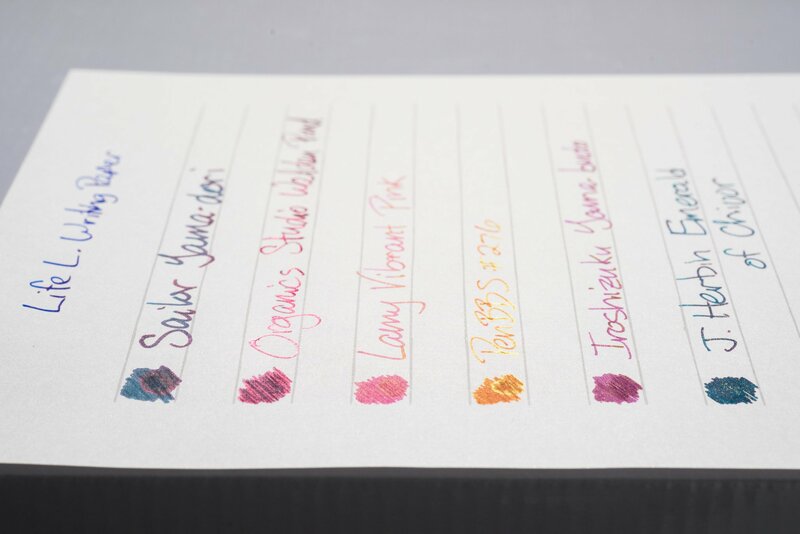 While you obviously need an ink that has sheen, you also need a paper that will show it. Even if you have an ink with high amounts of sheen, you’ll only be able to see it on certain types of paper. Why is this true? For a detailed explanation, you should read my article on sheen, but a basic explanation is that you need a paper that doesn’t absorb the ink too quickly and allows it to dry on the surface. 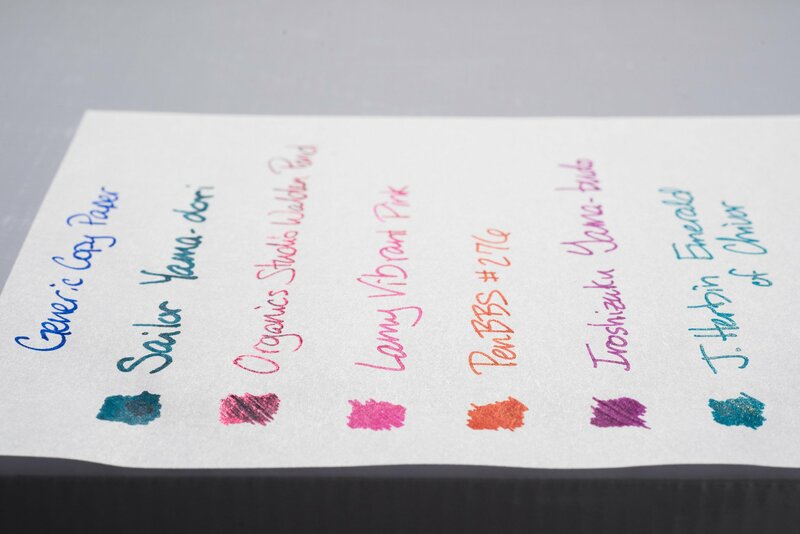 Some papers absorb ink more quickly than others, so this is why your choice of paper matters when you want your ink to sheen. If you use a cheap paper that absorbs the ink too quickly, not only is there a chance that it will feather and bleed, but it’s likely you won’t see any sheen either. So now that you understand why paper matters, let’s see how different papers affect sheen. 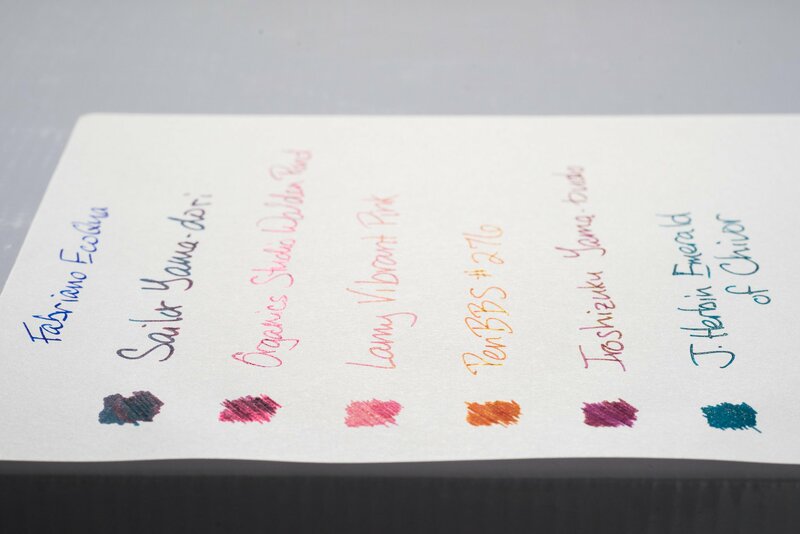 To see how paper affects sheen, let’s look at a bunch of the most popular papers for use with fountain pens. 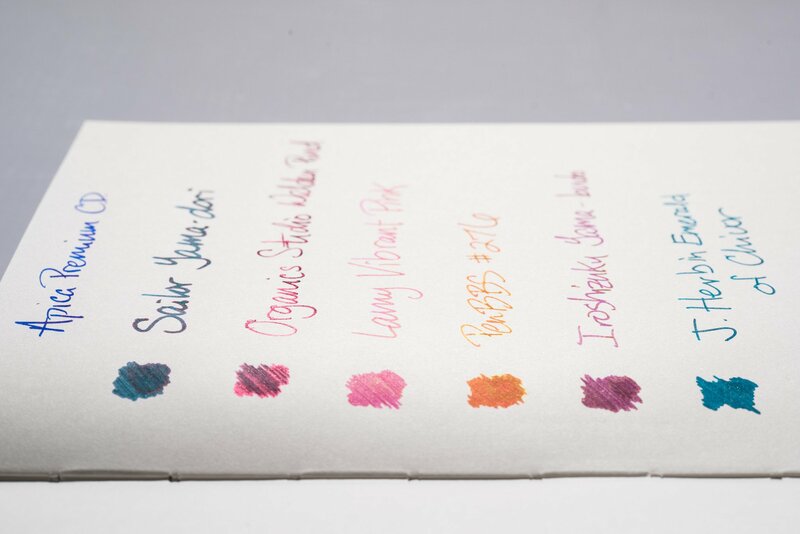 Below you’ll find a variety of different papers that I’ve tested with the same inks. For each ink, I wrote normally and did a heavy scribble. While I didn’t use the same pen for every different ink, I did use the same pen for the same ink every time. 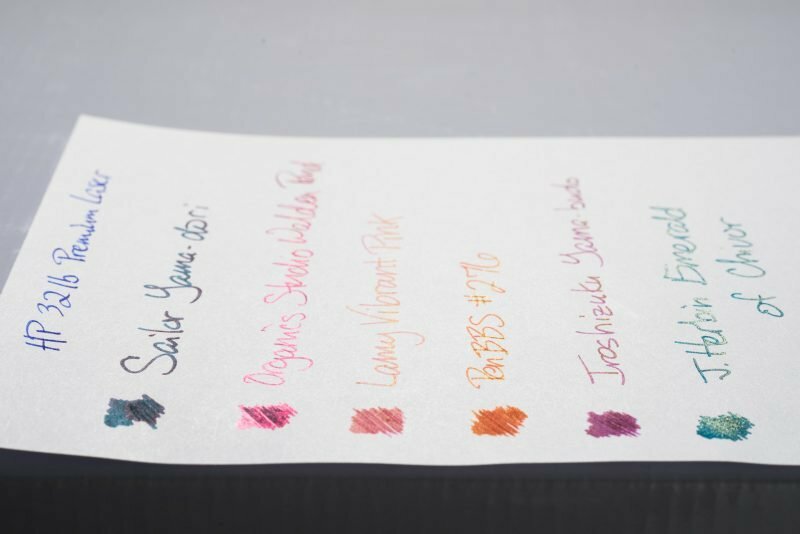 You’ll see that the different papers do indeed affect how much sheen each ink shows. About these photos: All photos were taken with the camera, lights and paper in the same position. The amount of sheen that you see is very dependent on the angle of your paper relative to a light source, so I kept all of the variables consistent so the amount of sheen you see would be true to the paper and not affected by anything else. I’ve uploaded three photos for each paper sample. The first is a top-down view so you can clearly see what paper and inks were used. The second is a side view that shows the sheen for all of the inks. 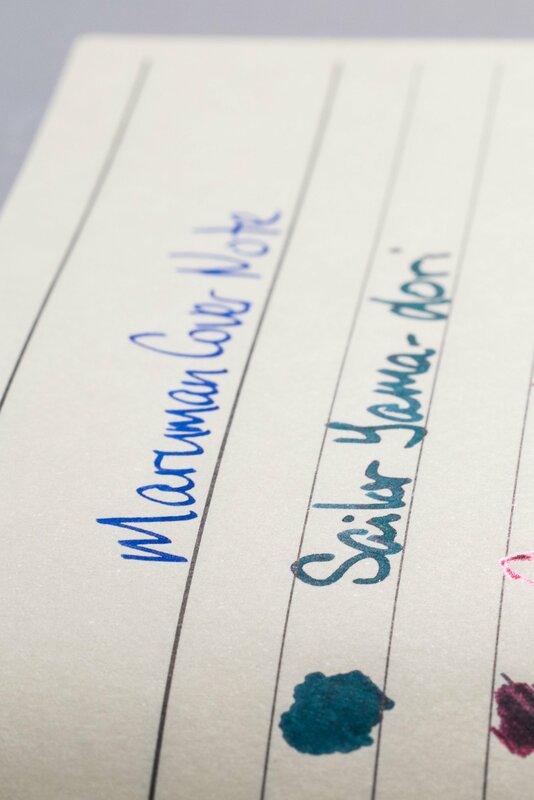 The third is a cropped version of the previous photo that shows the Yama-dori sheen in more detail. So that you have a reference point, I want to point out the color of each ink that I used and also its sheen color. Typically considered to be the sheen king of paper, this one did not disappoint. Every ink sheened on this paper and many showed the most sheen out of any paper. 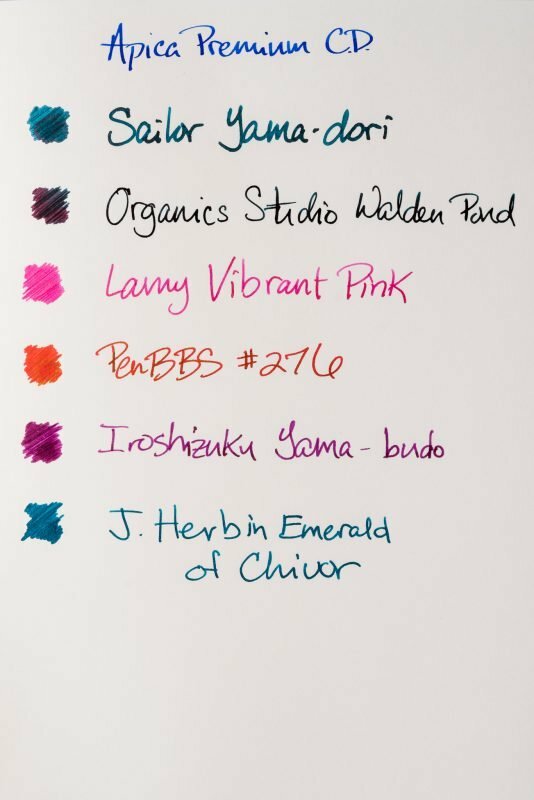 The sheen for most of the inks is also the most intense on Tomoe River. 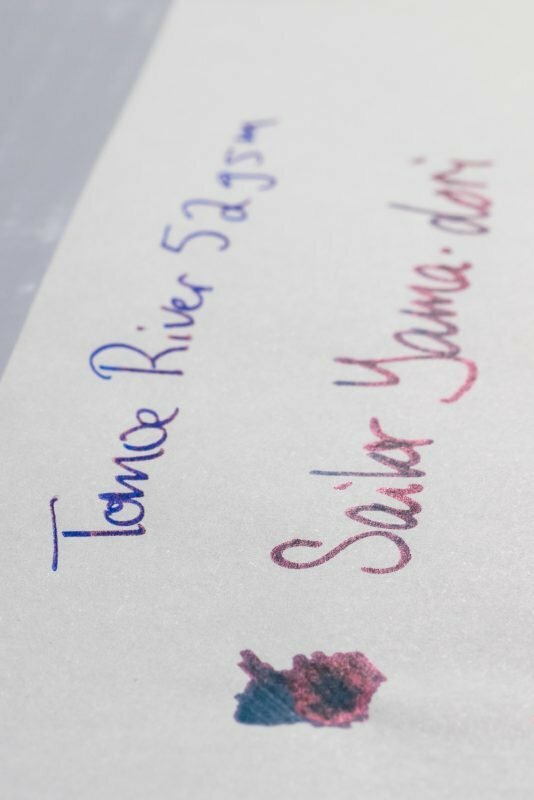 This paper easily holds its own against Tomoe River as far as sheen is concerned. Every ink showed a good amount of sheen. Another great paper from Life. 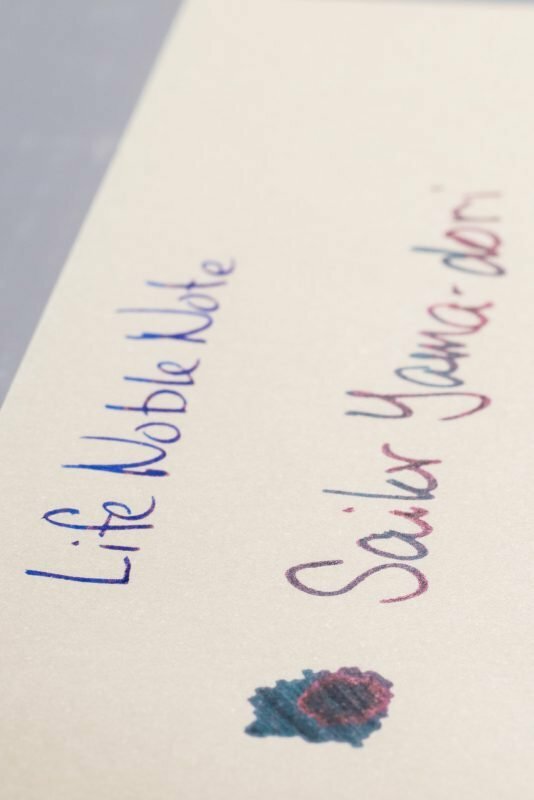 The “L” paper doesn’t show quite as much sheen as the Noble line of papers, but it still shows more than enough to make your writing fun and interesting. 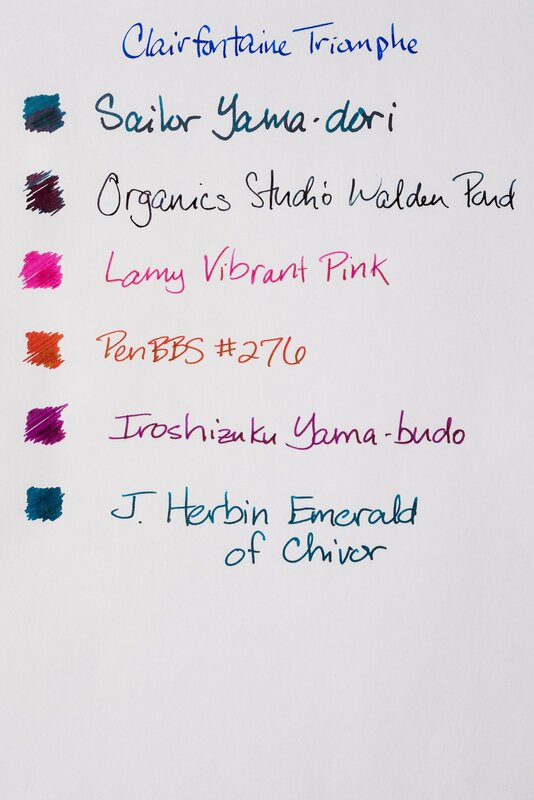 This is one of my favorite papers and it shows a lot of sheen. I would say it is comparable to the Life Noble. 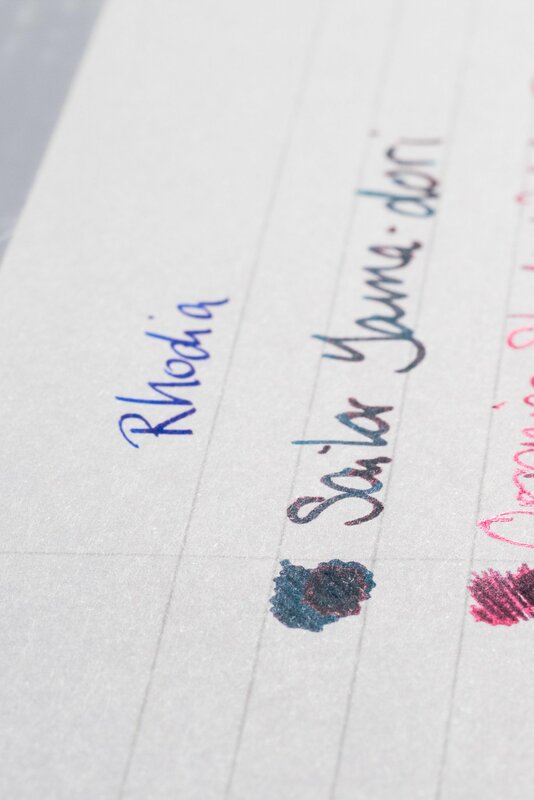 Rhodia is a very fountain pen friendly paper, but does not do so well with sheen. 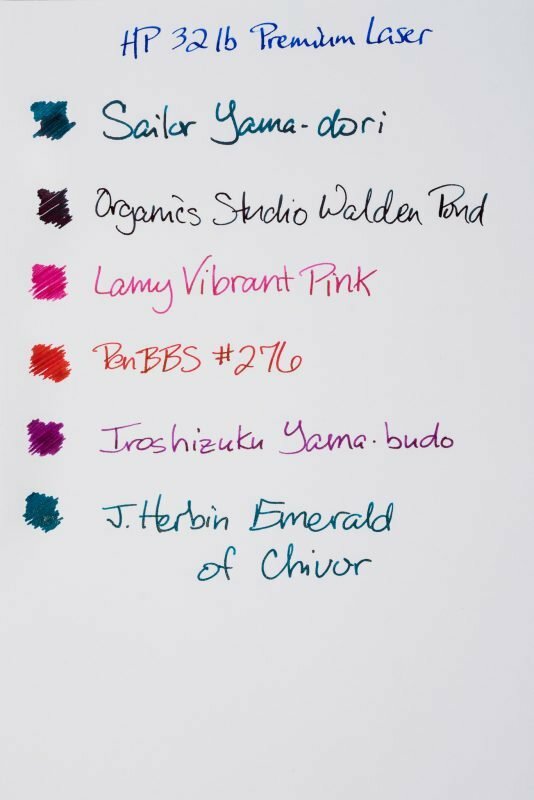 While it does show a bit of sheen for all of the inks, it is very weak and hard to see for most. Rhodia is nice if you want a nice, inexpensive paper to write on, but not if you want to see a lot of sheen. 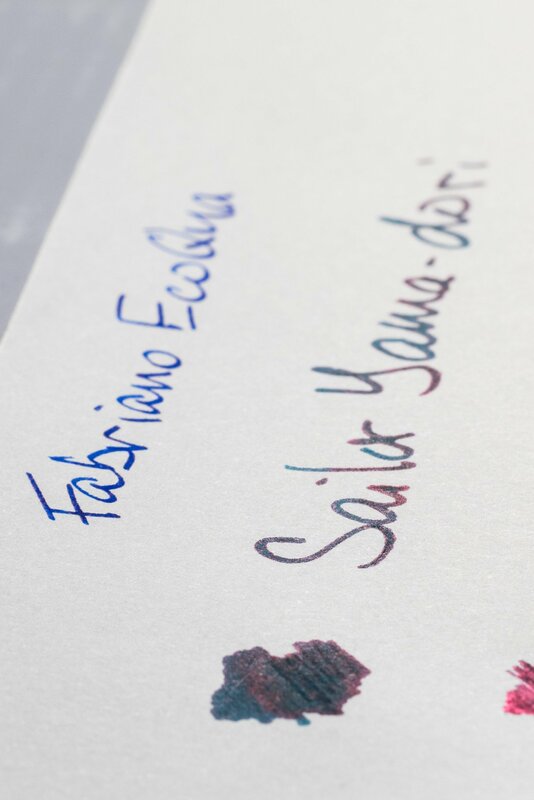 Another one of my favorite papers, Fabriano EcoQua notebooks have paper that shows a surprising amount of sheen for their cost. 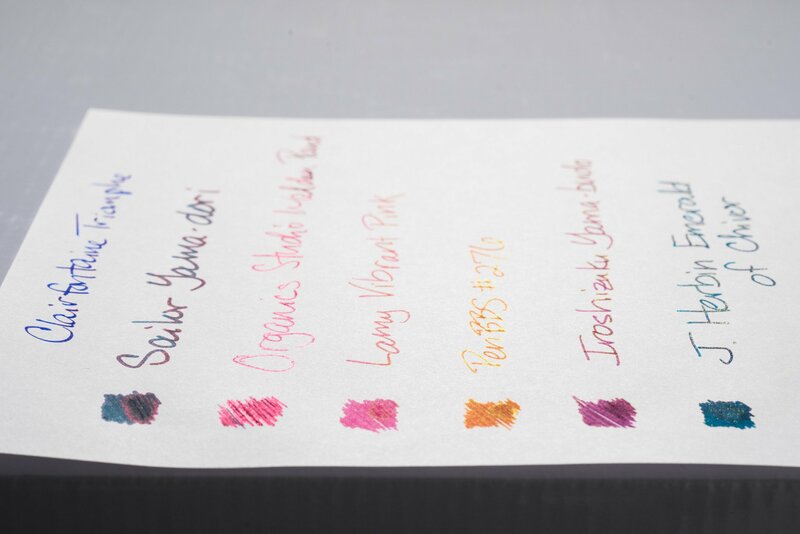 While it’s not as much as some of the premium papers, it is enough to make your ink look good. I had high hopes for this paper and must admit I am pretty disappointed in how much sheen it shows. The notebooks cost as much as Life Noble Notebooks, so I expected a similar experience. Sadly, this wasn’t the case. 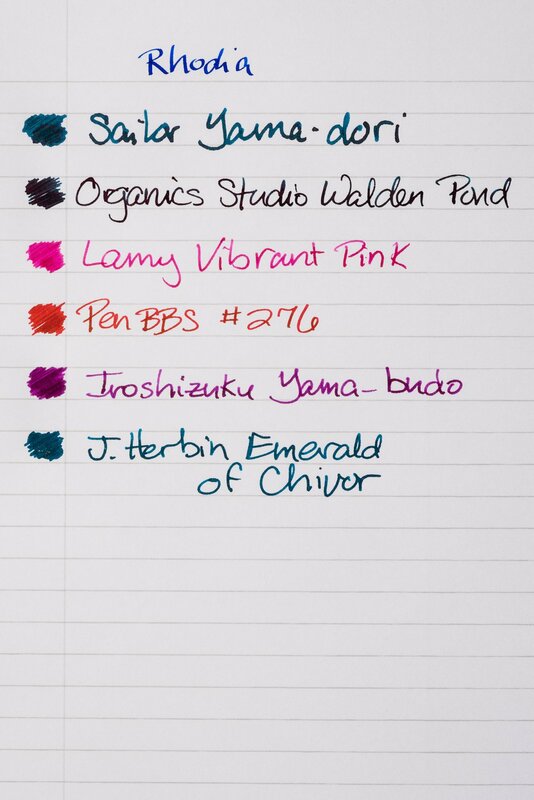 Some inks like Emerald of Chivor showed almost no sheen at all! While it is nice paper, if you want to buy a notebook that will give you a lot of sheen, go for one made by Life or Midori. 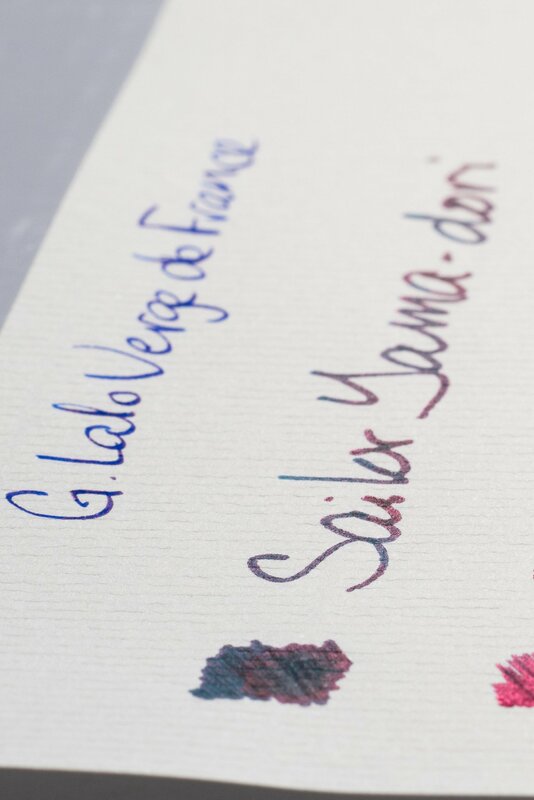 People love this paper because it is inexpensive, smooth and fountain pen friendly. It is not a high-sheening paper. 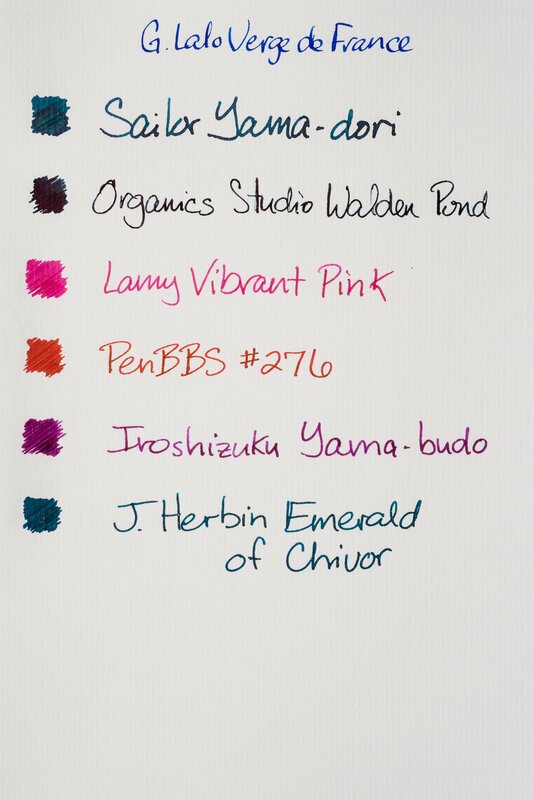 Most of the inks showed a bit of sheen, but not an impressive amount. If you want a cheap paper that’s nice to write on, this is a good choice. 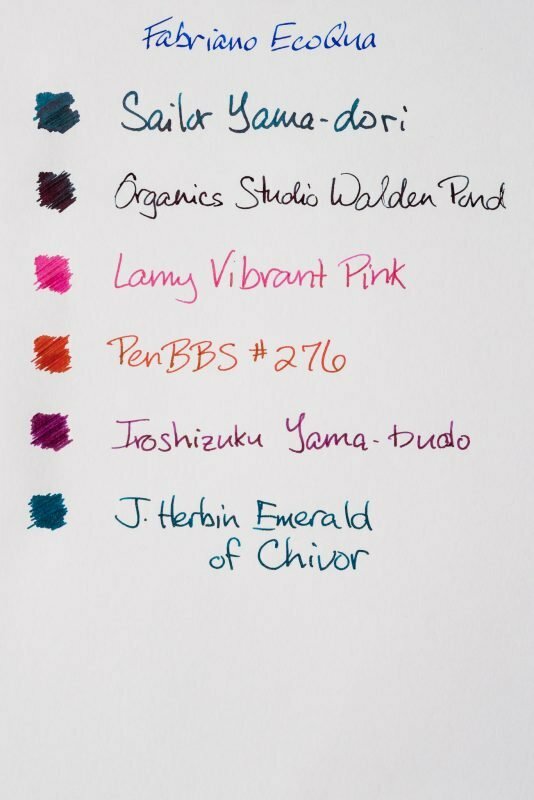 If you want to see a lot of sheen, this is not a good choice. This was probably my biggest surprise out of all of the papers. 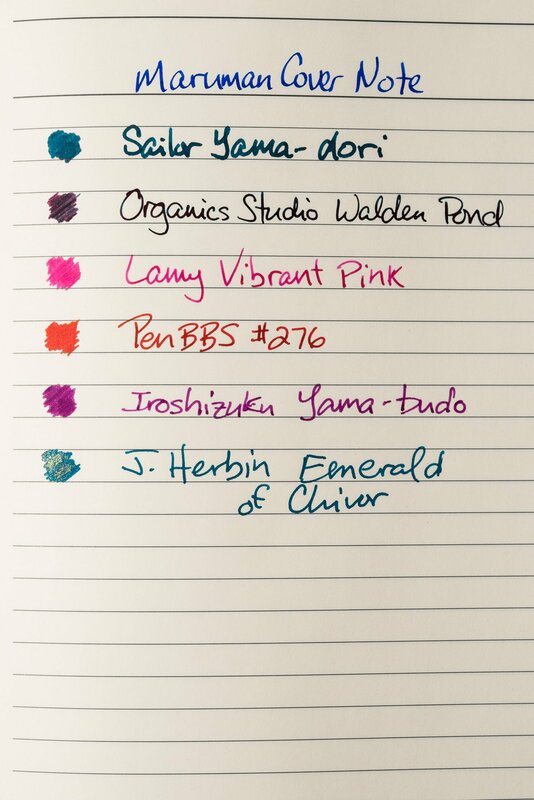 It shows a lot of sheen, which I was not expecting from a non-Japanese paper. It also might be the smoothest paper of the bunch. If you’re looking for an ultra-smooth paper that shows a lot of sheen, this should be at the top of your list. This paper shows some sheen, but not nearly as much as I had hoped. I think you would buy this paper for the writing experience and reader experience and not so much for how much sheen it shows. You might also notice that this is “laid” paper, which means it has lines running across it from the manufacturing process. If you’ve used this type of paper before, you’ll probably notice I wrote across it going against the pattern. I did this because I cut a piece of A4 paper in half and used it like an A5, which rotated the lines 90-degrees. If you’re wondering, I wouldn’t recommend this, as it makes writing a little more difficult. I added this notebook to the roundup because of how little sheen it shows. I bought it to use as my daily planner and, going strictly from how the paper felt, I imagined it would be a premium paper. 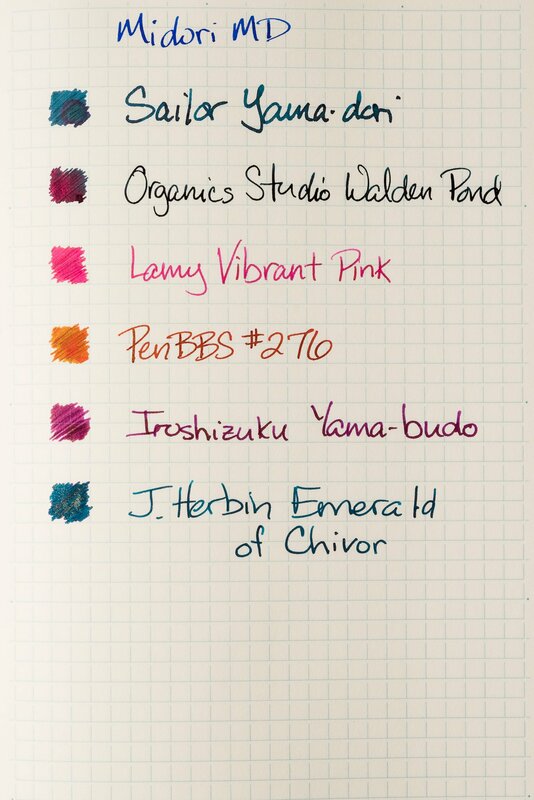 While it is nice to write on, imagine my disappointment when I saw almost no sheen from any ink I used. 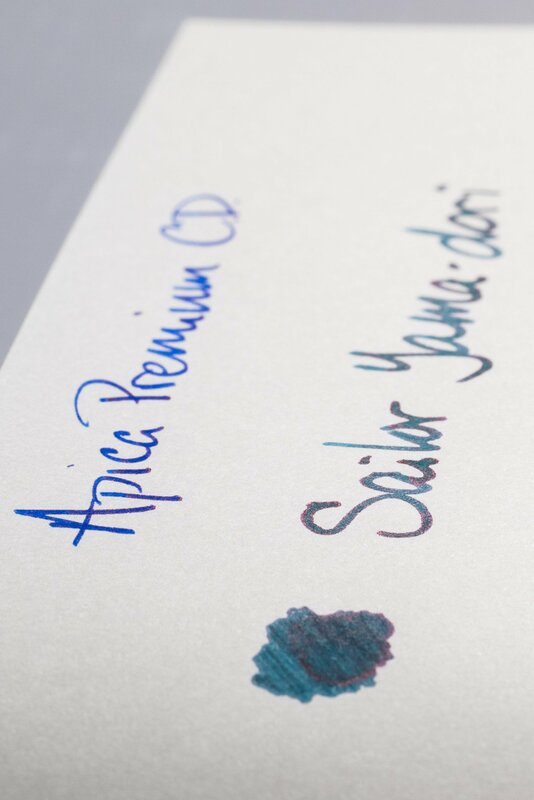 This just goes to show that you can’t assume a paper will show sheen just because it’s nice and smooth. 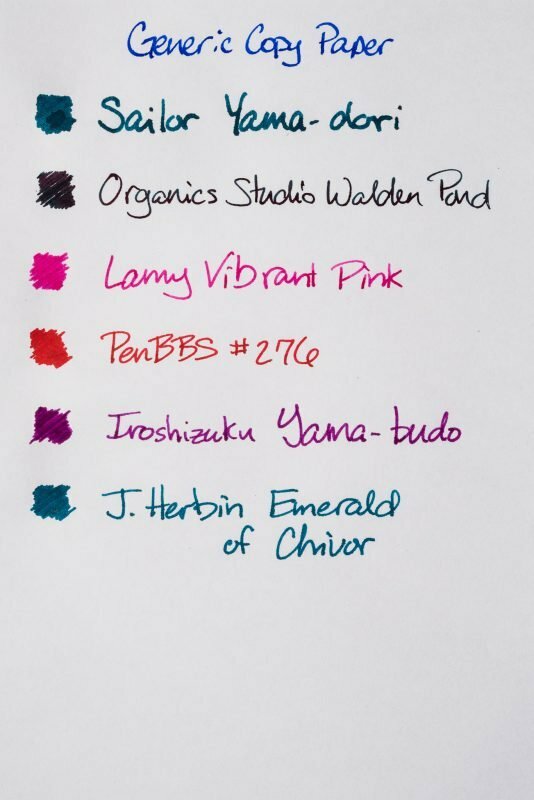 As expected, generic copy paper showed no sheen for any inks except for the Organics Studio (which speaks much more to the ink than to the paper). Unless you have no other choice, you shouldn’t use copy paper with your fountain pens. 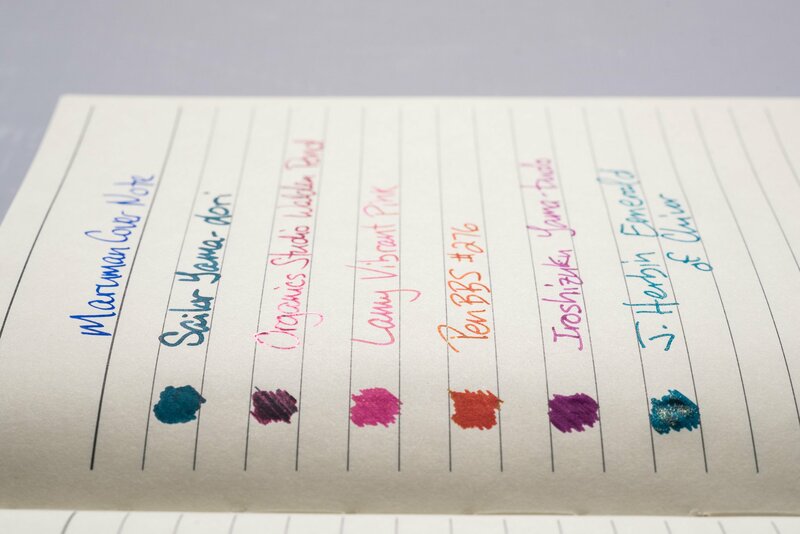 You can see that, while the majority of inks showed sheen on most of the papers, the amount of sheen did indeed change depending on which paper was used. The paper that showed the least amount of sheen, the generic copy paper, is also the lowest-quality paper in the test and is not something you would want to use with your fountain pens. 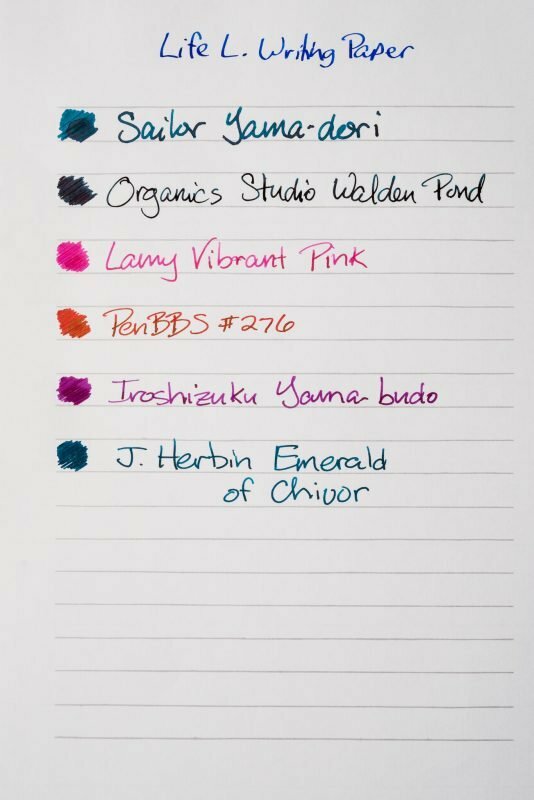 As for the highest amount of sheen, I don’t know if one stands out above the rest, but there is definitely a correlation to the quality (and cost) of paper and the amount of sheen that it shows. I found it interesting that the texture and, more specifically the writing feel, of a paper does not correlate to how much sheen it shows. 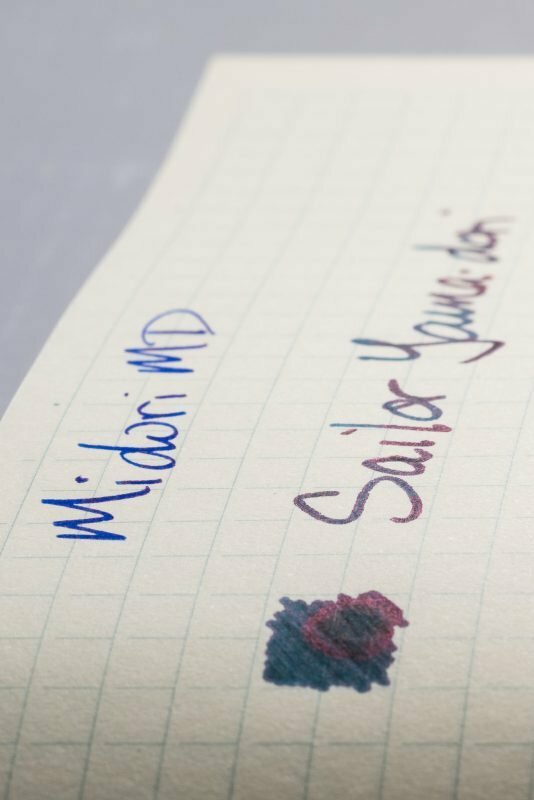 The Midori MD offers some feedback and the Clairfontaine Triomphe is extremely smooth, but both show about the same amount of sheen. Furthermore, the Maruman Cover Note is very smooth paper that I would compare to Life “L” paper, but shows almost no sheen at all. When comparing the same inks side-by-side on different papers, I noticed something that I had never really thought about before. 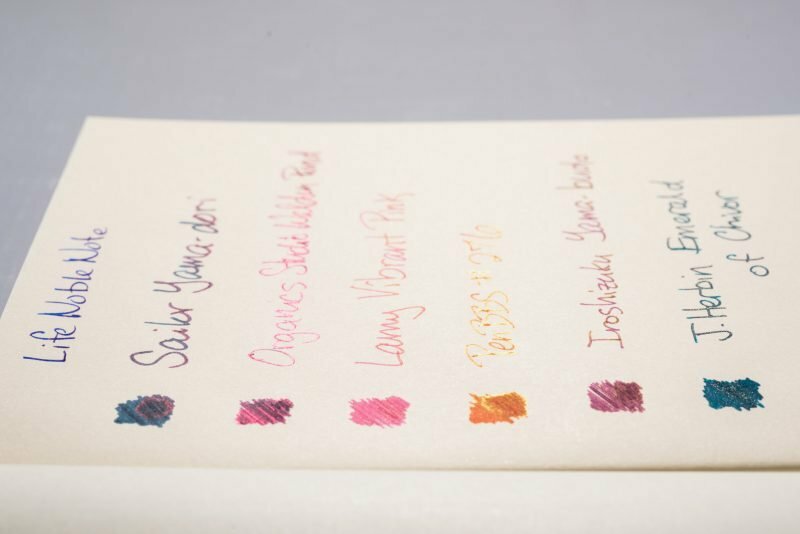 While an ink might have sheened on a lot of different papers, the intensity of the sheen was different. 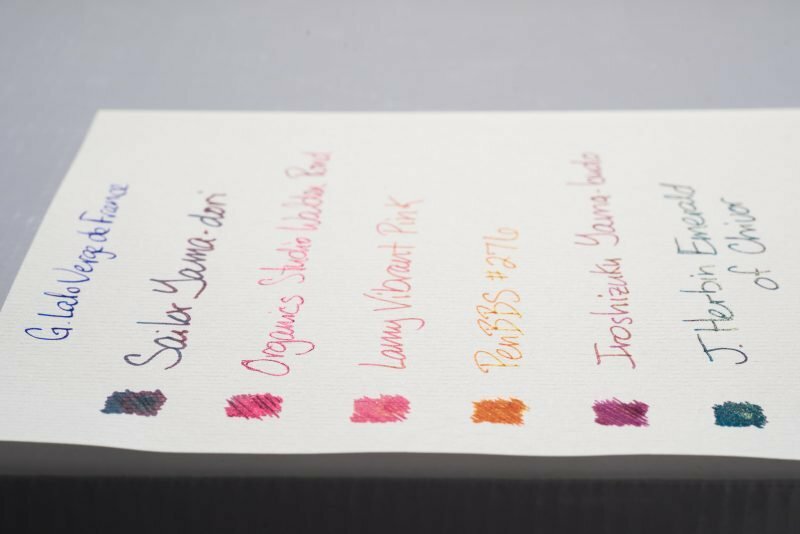 For example, Sailor Yama-dori showed nearly the same amount of sheen on Tomoe River versus Fabriano EcoQua, but the color and boldness of the sheen was more pronounced on the Tomoe River. Maybe this is why some papers show off sheen better than others… it’s simply easier to see because it stands out more. 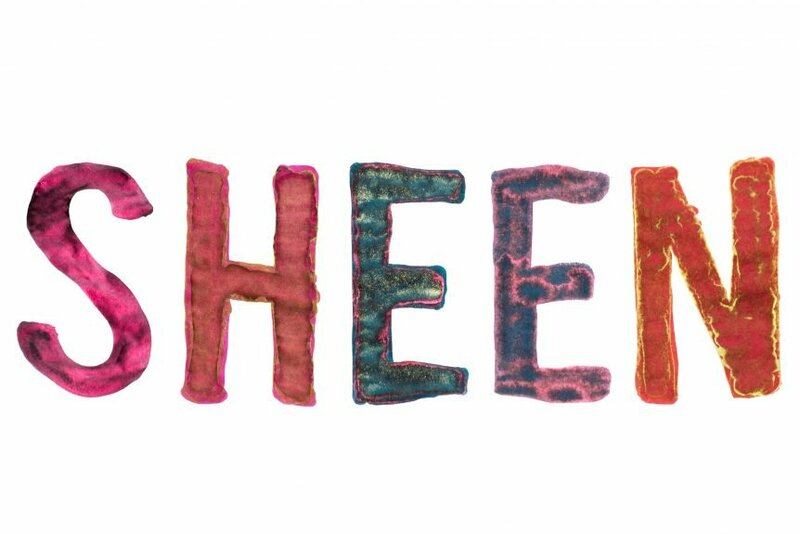 While there are definitely papers that simply sheen more than others, this sheen intensity likely plays a role in how much sheen we perceive. 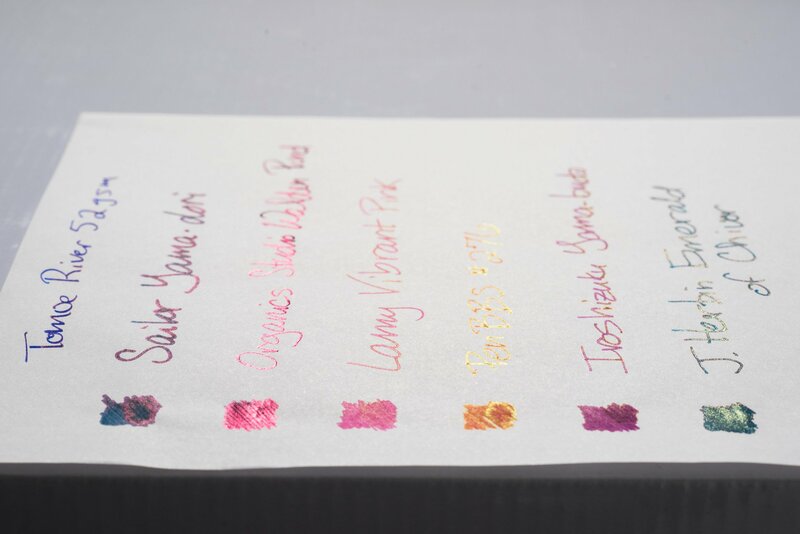 One thing to note is that higher amounts of sheen typically relate to longer drying times, so some of the papers with the highest amount of sheen like Tomoe River also have some of the longest drying times. If you need your writing to dry more quickly, you might have to sacrifice some sheen. 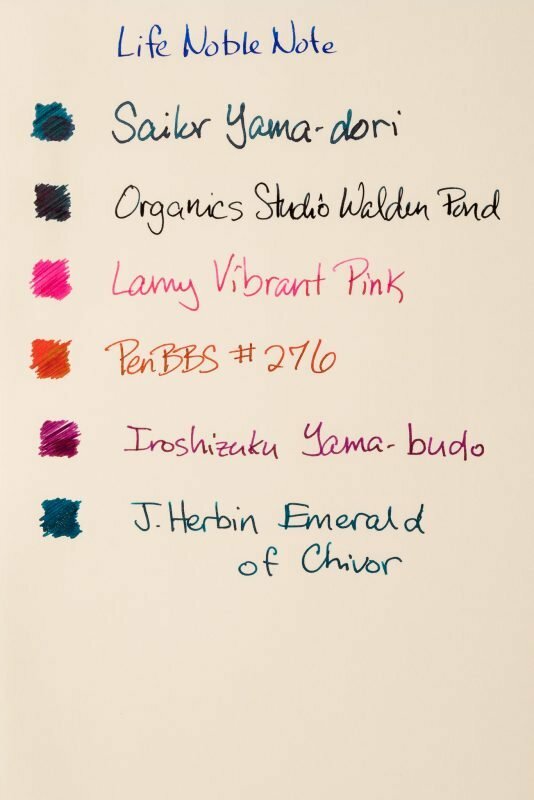 Tomoe River High If you want sheen, this should be your top paper choice. Life Noble High This is one of the highest-quality papers around. 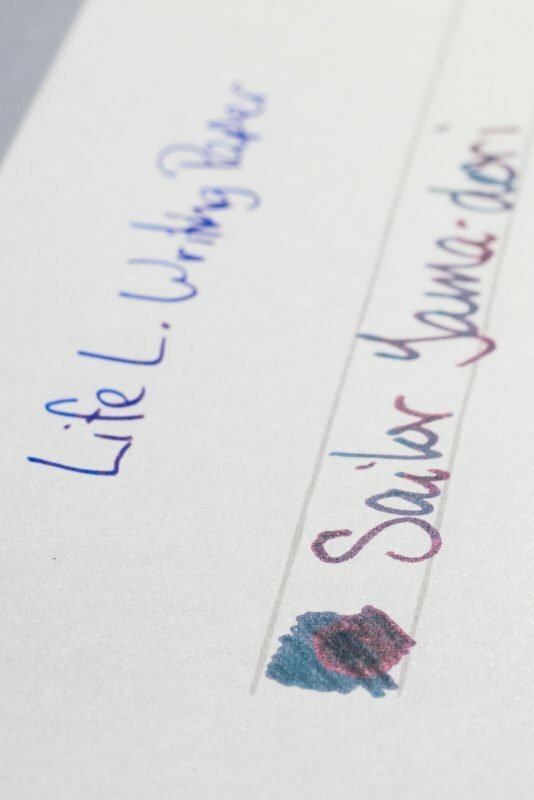 Life "L" Writing High If you write a lot of letters and use sheening inks, you should find some of this paper. Midori MD High Midori MD journals are some of my personal favorites and they show a great amount of sheen. Rhodia Low Although Rhodia is fountain pen friendly, it does not show very much sheen. Fabriano EcoQua Medium My favorite budget notebook, this paper probably has the best price-to-sheen ratio. Apica Premium C.D. Medium My biggest disappointment of the bunch, I expected a lot more sheen than this paper gave me. 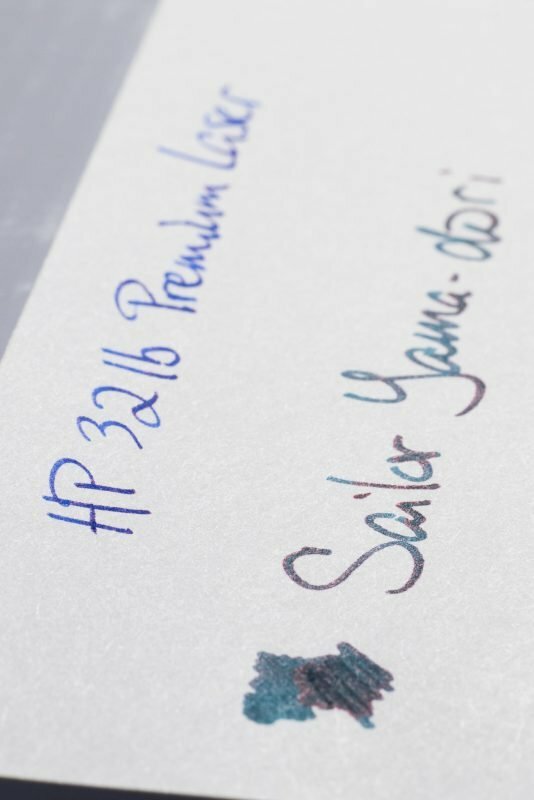 HP Premium Laser 32lb Low Another great paper that is fountain pen friendly but doesn't show much sheen. 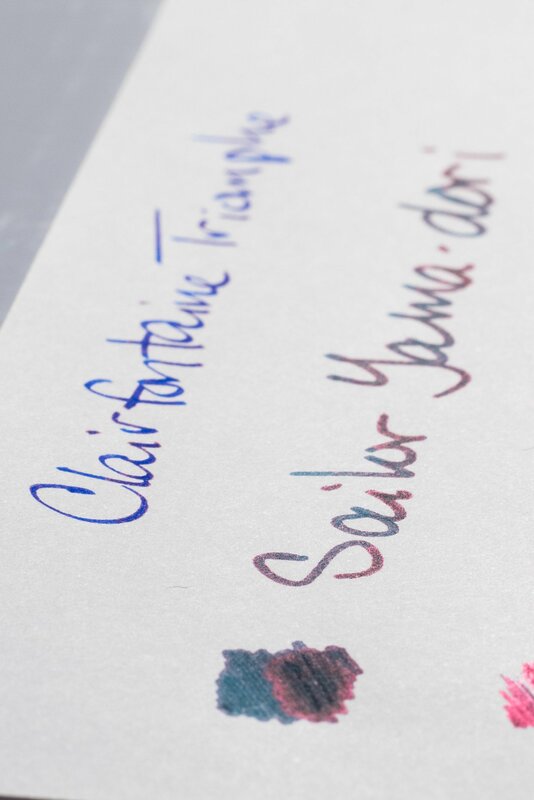 Clairfontaine Triomphe High My biggest surprise, this paper shows a lot of sheen, in addition to being amazingly smooth. G. Lalo Verge de France Medium Doesn't show as much sheen as the other premium-priced papers, but is the only laid paper in the roundup. Maruman Cover Note Notebook Almost None Nice paper to write on, but shows almost no sheen. 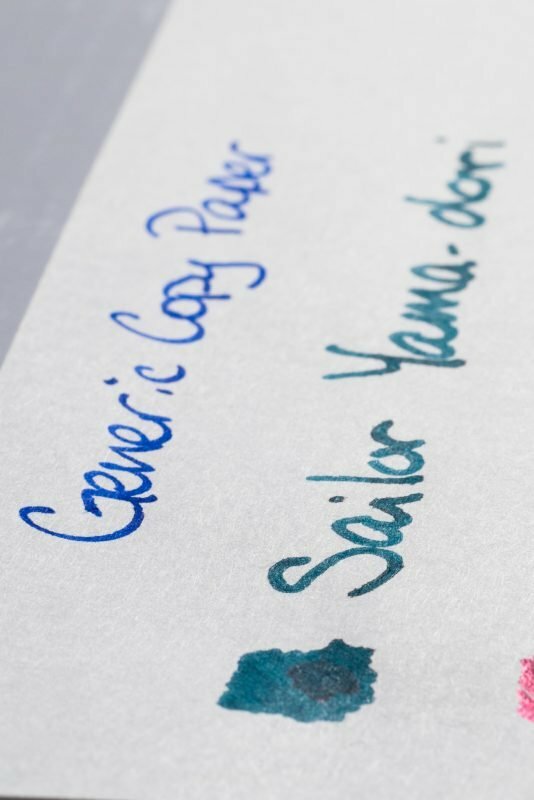 Generic Copy Paper Almost None If you use a fountain pen, don't use cheap copy paper. Thanks for this neat, detailed comparison. I’m curious if there’s something about Rhodia paper’s coated vellum that resists sheening, despite its smoothness. I ask because I’ve found it to be smoother than Life or Midori. You are very welcome, Steve. There might be something to that. One of these days I’m going to do more research on the coatings that are used on papers and compare how they effect the writing experience.